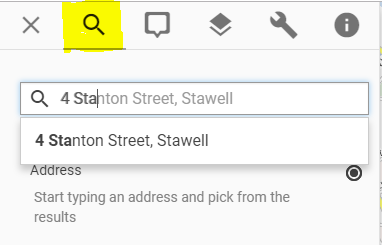 If you know the address of the location you are interested in, you can type it into the search box. After you’ve typed several characters, the box will offer suggestions. Keep typing until your target property appears. To accept the first suggestion, hit ‘Enter’. Otherwise, you can use the arrow keys or mouse to select the one you want. The map will zoom to the selected address, and automatically open the information panel to show you information about your location.